Yes, you heard that right. Rs 200 Bonus recharge is up for grabs with Frizza mobile application. Now, you don’t have to pay anything to get that recharge. Frizza is a brand new mobile application and the concept is similar to Mcent app. You can complete offers to make money (recharge) and fill your mobile with some topups. Once the app is installed, open the app and register your mobile number with frizza. Hey, you just entered the world of Bonus and recharges. Jump in your offer wall where a number of apps install offers are listed. Touch anyone and see there is a set of instructions to execute and get the coins credited for the same. You are on the track but you missed it. Yes. If you complete a minimum of 5 offers successfully, you become eligible for a 200 rupees bonus while you already got 5 rs signup bonus just for joining. You won’t be able to hold your horses to know that you will earn additional recharges and bonus just for inviting your friends and family members. 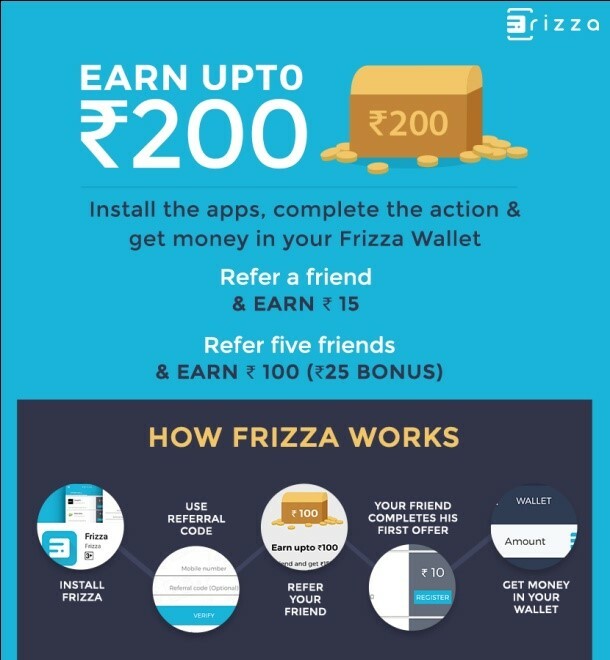 Each referral signup will credit 15 rupees in your frizza account. The more you refer, the more you earn. Moreover, there is a bonus waiting for you at every stage of your growth on frizza.